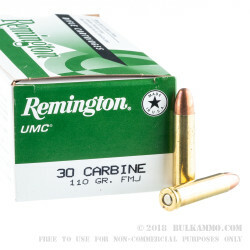 A great choice for those who want to enjoy their M1 carbine or any number of other guns chambered in the venerable .30 carbine as this is the perfect plinking and target round for the money. The UMC brand name has been a perennial performer in the Remington stable over the years and offers you a value that you cannot find with other ammunition lines that simply makes sense for bulk shooting. The ballistics are surprisingly good and the reliability is second to none. The plain, straightforward build features a full metal jacket projectile and a premium brass cartridge casing with a Boxer primer. 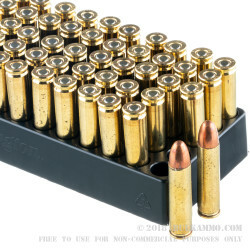 The reloadability of the cartridge is high and the resulting benefit to hand loaders makes this an excellent donor cartridge with a fantastic price point. 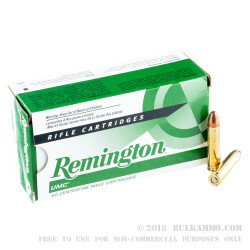 Such is the case with all the Remington UMC cartridges which have always been a relative bargain. This load can achieve 1990 feet per second velocity and delivers a heavy 967 pound feet of energy at the muzzle. 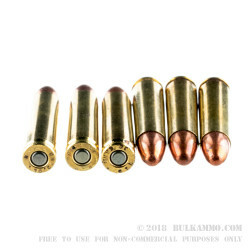 The consistent performance numbers breeds excellent accuracy and this becomes your go-to round for anything that doesn’t require a soft point or hollow point projectile.